Many flowers have important symbolic meanings in Western culture, and the practice of assigning meanings to flowers is known as floriography. For example, red roses are often regarded as a symbol of love, beauty, and passion. Lilies are used in burials as a symbol referring to "resurrection/life". They are also associated with stars or the sun, with the petals blooming or shining. Red poppies are a symbol of consolation in time of death, they are worn to commemorate soldiers who have died in times of war. In the UK in November you will see many people wearing artificial poppies on their clothes, they are also worn in New Zealand, Australia and Canada. When I was growing up I thought I knew all about poppies – in England they were red and in Wales they were very slightly smaller and bright, egg yolk yellow. Since then I‘ve learnt differently of course. They come in almost every shade including sky blue. They appear all over my garden, especially in the vegetable beds where they pop up among the cabbages and leeks, pushing aside the leaves of lettuces and give shade to the strawberries. They seed so profusely of course that I’ll never be able to get rid of them, so I just let them grow and enjoy their fleeting beauty. What I hadn’t seen until I came to Yorkshire was poppies labelled as papaver cambrica, i.e. Welsh poppies, but these were burnt orange in colour. It is normal round here, but still a little strange to me. At our present home you will brush past a thick, tickly, knee high curtain of these as you make you way from the gateway to the front door. They flower from about April, perhaps May, until November and lots of people go ‘Woah!’ there are so many. But to me they aren’t the real thing. 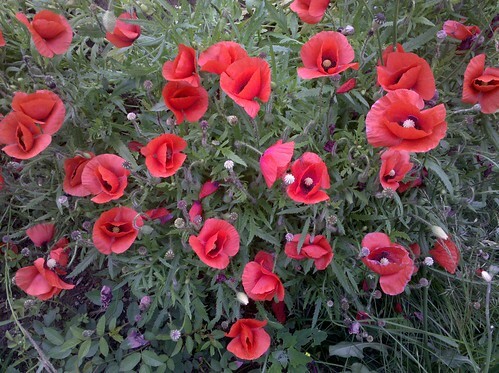 After all, how on earth can orange poppies be Welsh? I’m sure there is a botanist out there who will tell me. I recently fell for a poppy called Papino found in the depths of Norfolk – in this case such a pale yellowish green as to be almost cream. It is tiny, about 4 inches high with usually only one or two flowers open at a time, and very, very perfectly beautiful. I planted it in a pot near the front door alongside my scented geraniums. It is obviously a relative of the poppies I already have, but not a close relative. However, as any gardener will tell you poppies are very promiscuous. Was it a cross or not, perhaps a reversion to type, for right opposite the front door in the long border fringed with orange there appeared one egg yolk yellow, Welsh poppy. Hurray! Next day there were three and more to come. I have travelled in many lands and even owned a number of gardens, but hadn’t realised until today how much I missed the poppies of my childhood. I’m just waiting now for the flower heads to become seed heads and then I’ll try to catch the seeds before the wind sends them out onto the hard driveway, the busy road or into my neighbour’s garden. Then, may be, next spring there will be a whole clump in the corner of my front garden. Which flowers are important to you I wonder? Often people walk around this quite large garden and they look appreciatively at plants they aren’t used to. The unusual things -the twisted hazel and the variegated ceonothus - and then they spot one particular plant, usually a different one for each person, and they begin to beam. ‘Oh you’ve got ……. We had it in our garden when I was young.’ That is the commonest reaction. Or perhaps it was their grandfather’s garden or when they first had a garden of their own. I really didn’t realise how evocative these little green beings can be. Another flower memory for me can be found inside the pages of my copy of the collected works of William Shakespeare. We did a project about flowers in Shakespeare at school. Think of ‘Midsummer Night’s Dream’. It is supposedly set in Greece, mainly in the woods outside Athens, but in fact is very English. On a summer’s day, many years ago, I went out into the Warwickshire lanes with a friend and we picked wild flowers – campion, daisies , honeysuckle, peasblossom and all the rest. Then at the end of the day I pressed them between the pages of my thick, thick Shakespeare, returning them perhaps to a Warwickshire lad, who probably knew those lanes as well, if not better, than I did.